A study made by European Bioplastics and the Institute for Bioplastics and Biocomposites (IfBB, University of Hannover) estimates the worldwide market of bioplastics* in 2011 to 1.2 million tonnes. Market data from this study forecasts production capacities will multiply by 2017 – to more than 6 million tonnes. * The term "bioplastic" groups bio-based and/or biodegradable plastics. This study only focuses on thermoplastics. In 2017, the previously mentionned study classes bio-based thermoplastic polymers in the following order in terms of production volume: 1# bio-PET, 2# PLA, 3# bio-PE, 4# Biodegradable polyesters, 5# Mix starch, 6# PHA & PA.
Bio-based resins can be used in a wide variety of applications, with more or less demanding specifications: from automotive to packaging, from electronics to consumer goods, etc. The study indicates that in 2012, the packaging industry was the most important user of thermoplastic bioplastics, followed by the automotive and electronic sectors. Discover all offered resins registered on the website Agrobiobase. Among bio-based intermediates, there are chemicals used for the synthesis of resins and those used for the production of additives. For example, epichlorohydrin is used for synthesis of epoxy resins, 1,3-propanediol for the manufacture of PTT (polytrimethylene terephthalate), succinic acid to obtain PBS (polybutylene succinate). Several plant-based intermediates exist today for the production of polyurethanes: polyols, isocyanates, succinic acid, isosorbide. Bio-based chemicals are also available for the synthesis of additives for plastic implementation (eg plasticizer). Discover all offered chemical intermediates. 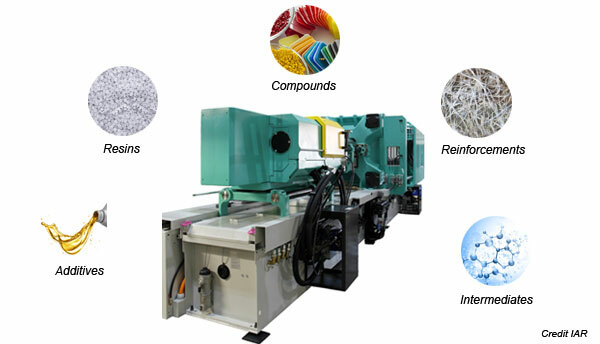 Suppliers offer bio-based processing aids to implement plastics (petro-based or bio-based), like plasticizers, release agents, corrosion inhibitors, etc. Natural fibres (flax, hemp, wood, kenaf, sisal, coconut, jute, etc.) are integrated in some plastics, to provide them mechanical properties and improve their environmental profiles. Automotive industry already uses this type of reinforcements to lighten vehicule parts. Discover all offered reinforcement fiber solutions. Among compounds made from previously mentionned raw materials, either only bio-based matrix (resin) are used, or only bio-based reinforcement (fibre), or both.